ever 'Totally Terrific Tomato Festival' in 2012. A real feast for the eyes - and the taste buds! This is my personal take on the best of some of the 100's of varieties I've grown over 42 years of tomato growing! I'm adding a couple more tasty varieties to my list this year, after trying a few new varieties for this year's Tomato Festival. That was such a great excuse for a tomatoholic like me! Every year I try one or two new varieties which sound promising - comparing them to my tried and trusted ones which I've grown for many years. Sometimes I'm delighted to discover a new gem to add to my list - but often I'm disappointed. They have to be easy to grow, disease-resistant, productive and most of all have really great taste, in order to be a good variety in my eyes! I would never grow those ghastly 'Moneymaker' types which have virtually no taste but produce tons of tomatoes - whatever is the point of putting energy into those when there's so many other great tasting ones out there? Many of the newer F1 varieties are promoted by seed companies who own the plant-breeder's patents and despite the always glowing catalogue descriptions - I've found most of them disappointing. They often have very little taste or anything else to recommend them! Many are bred for a totally different climate - something people often don't factor in when choosing varieties. Rosada was the brilliant exception to that - but sadly it has now been dropped by all the major seed companies in favour of those bred by themselves, as they didn't own the patent! I have enough seed for the next couple of years or so after buying some extra last year - but after that there will be no more here - and I honestly don't know how I will manage without it!. Many of the open-pollinated Heritage varieties have a lot more flavour - but not all. That often depends on where they're grown too. Some are very fussy and are far more suited to continental climates like eastern Europe or the USA, where they enjoy much hotter, drier summers and far higher light levels than we do here in Ireland! Many of those 'continental' varieties that I've tried stretch towards the light as if absolutely desperate for it - poor things! Even their shape can be a problem too. Varieties such as Costuloto Fiorentino and Costuloto Genovese admittedly do have a great flavour - but their fascinatingly ribbed and pleated shapes unfortunately attract and hold on to any moisture in the air, which in the humidity of an Irish polytunnel in our average often damp summer automatically results in disease! Climate can affect every aspect of tomatoes. Growing conditions here in Ireland are totally different to the much drier and warmer south or east of the UK - where light levels are also generally better and where many seed companies trial grounds are based. Our summer temperatures are always an average of 10 degrees centigrade lower all summer long and we also get a lot more rain - resulting in the kind of high humidity which cucumbers love - but tomatoes really hate!! Lower levels of light can affect tomatoes more than many other crops too. Although we're quite close to the east coast here - only about 5 miles as the crow flies - we don't get the benefit of the brighter 'reflected light' that many living closer to the sea do. This is because we're also over 400 feet above sea level and even in summer we often get gloomy low cloud and sea mist hanging around for much of the day, which may only clear for 3 or 4 hours around midday, then descends again about 3pm! As a result - tomato growing conditions here can be pretty challenging to say the least! I believe that any tomato which grows well and and tastes great here will deserve a space in anyone's greenhouse or polytunnel - wherever they may live! Tomatoes are a vitally important crop globally. For me it would be absolutely impossible to imagine life without them - whether it's just in your humble lunchtime BLT sandwich or salad, on your pizza for supper - or whether you're a Michelin starred chef! During his highly entertaining talk at the 2016 Totally Terrific Tomato Festival, Dr. Mathew Jebb, Director of our National Botanic Gardens imparted a mind-boggling piece of information - which was that each year the entire human race eats half of it's own weight in tomatoes! That perfectly illustrates just how important tomatoes are in our diet worldwide! I've always loved them - having grown up eating the wonderful sun-warmed produce from my parents greenhouse. That first unmistakable scent of tomato foliage in spring always brings those memories back to me instantly. As a member of the HDRA - (now Garden Organic UK) Heritage Seed Library for many years, I held a tomato day in the National Botanic Gardens here back in the late 1980s, using varieties many which were kindly provided by the HSL. In early 2012 - seeing the stunningly beautiful new black tomato Indigo Rose sparked ideas again and seeing it's beauty galvanised me into action once more! 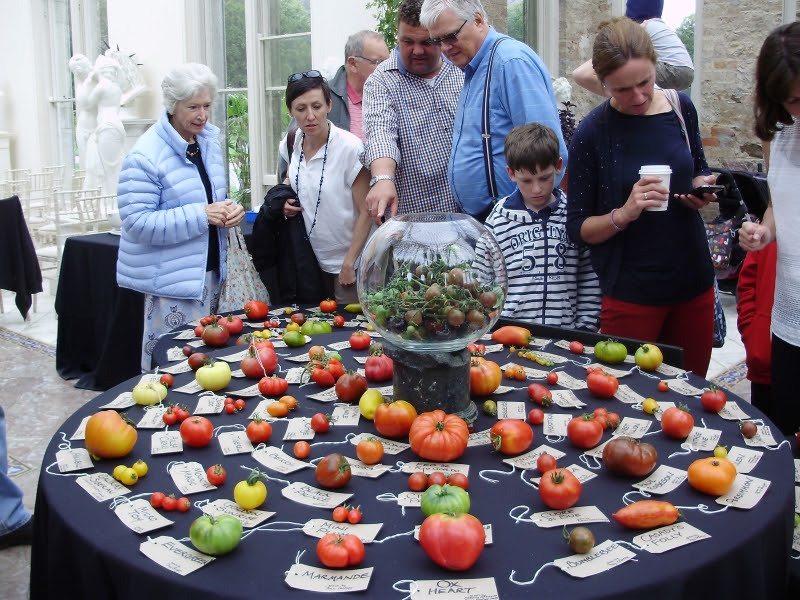 This resulted in my idea of a 'Totally Terrific Tomato Festival' in the hope that it would raise public awareness of the ever-increasing importance of preserving genetic diversity. Indigo Rose was the first ever naturally-bred, high-anthocyanin tomato and it's seed only became available for the first time commercially in early 2012. It's stunning colour is so breathtakingly beautiful and unusual that I knew it wouldn't fail to catch people's attention. It certainly did that - and two very successful, fun festivals have happened since. After the first two - there was a hiatus for a couple of years as unfortunately I had an accident just after the second Totally Terrific Tomato Festival in 2013, breaking my right shoulder into several pieces. Having been left with only a half-working arm, I knew that sadly I wasn't going to be able to do that huge amount of organisation and work single-handedly ever again, in addition to still trying to grow our own food here! I hoped that some other 'tomatophile' would eventually pick up the baton and carry it on. So you can imagine my delight when Jane Powers, the wonderful garden writer and gardening correspondent of The Irish Sunday Times, called me in late 2015 to say that she thought it would be such a pity if we lost it altogether and to ask me if I would mind if she put my idea to Lord and Lady Ardee of the beautiful Killruddery Estate, in County Wicklow. She felt that with their expertise in organising event, their beautiful surroundings and a perfect location easily accessible from everywhere, it could potentially be the perfect place to hold it. The rest, as they say, is history - and due to a lot of hard work, mostly on Jane's part and also by everyone at Killruddery - another highly successful Totally Terrific Tomato Festival was held once again last September. My 'baby' had found a wonderful new home! Many enthusiastic tomato growers from every corner of Ireland generously brought along their special treasures to share with us. There were competitions, talks, stalls selling all sorts of tomato-related products and general convivial 'tomatoness'! It was such a joy to see the 138 varieties of tomatoes in all their incredibly varied, eye-popping diversity, displayed and shown to perfection in the beautiful light surroundings of the Orangery at Killruddery. Seeing the wonder on the visitor's faces - especially the children's was such a joy. And I got to do the bit I love best - talking about tomatoes! It is vitally important that we preserve our heritage seed varieties - just as so many other tomato lovers before us did, over many centuries. bequeathing them in turn to us. We are the lucky recipients of an irreplaceable and priceless inheritance from those gardeners and food growers of the past and owe owe them a huge debt of gratitude. We are the current custodians of that genetic diversity. It is vital that we care for it and preserve it for the sake of future generations. So much precious genetic diversity in all food crops has already been lost. For me a life without tomatoes would be unthinkable - I don't know about you? Taste is a very subjective thing - it often depends what sort of diet you have or whether you smoke or drink - which can dull the taste buds. I reckon our taste buds are pretty unspoiled here having eaten mostly nothing but organic food for over 40 years and very little sugar! The tomato varieties listed here are mostly on my list because they have fantastic flavour. Some only develop their best flavour when cooked - others are better eaten raw. Also to be honest - one or two are on the list purely because they look stunning and the artist in me just can't resist them! How food looks is also important to me. We eat with our eyes - and I always like my food to look as beautiful as possible! All of them are worth preserving though - because at some time in the future, some desirable aspect of their genes, such as disease or pest-resistance, may possibly be needed in new, natural breeding programmes. We have no idea what as yet unknown challenge may arise with increasing climate change. This year was a really bad one here for tomato growing! All the information here is reviewed and updated each year. I've been asked so many times over the years which is my all time favourite variety. It's an impossible question for me, trying to narrow it down to just one - they all have their different uses. That's like asking me which is my favourite child!.... I suppose if I were to be allowed one of each type - then it would be a little less difficult - but not much! If I could have only one of each type - then it would have to be Maskotka - bush, Rosada - cherry plum, John Baer - classic medium, Amish paste - cooking plum, and Pantano Romanesco (beefsteak). There - I don't think I can narrow it down any more than that. But then again - perhaps if I was really put to the sword and told that all others would be lost and what would I save - it would have to be the incredibly versatile and good-natured Rosada! I think all bush varieties are much better grown in large containers raised up off the ground, as they tend to sprawl a little and can rot on the ground or get eaten by slugs if grown in greenhouse soil beds. A 10 litre container is fine size-wise. I use recycled coleslaw/mayo buckets from local supermarket deli (they just chuck them out for recycling and I sit those on grow bag trays as these retain any water or feed that drains through). Growing as a bush is actually the natural habit of tomatoes - we've just selected the varieties which are more amenable to growing as a cordon/upright fashion, purely for our convenience. Some refused to be trained however - and I rather admire them for that! Many are often the better flavoured ones too. Containers also restrict them a bit if they are a bit over-enthusiastic, thereby encouraging slightly earlier fruiting! I put the containers on the grow bag trays on upturned plant crates, barrels, benches, or something similar - where they can drape down decoratively and are much easier to pick without too much bending! Maskotka - My no.1 bush! (This little treasure is available from many companies now) Medium to large cherry sized fruit. Everyone loves the 'more-ish' almost 'tomato sauce' flavour of this one without fail - It's one of the varieties that my 'From Tunnel to Table' co-presenter Gerry Kelly was 'swooning about' (to quote one listener) when we had our chat on LMFM radio the week before the 'Totally Terrific Tomato Festival' in 2012. I've grown this variety for many years now and I absolutely adore it! A middle-sized, incredibly productive, disease resistant bush - it's always without fail my very earliest variety - and also the last. Always ripe the first week of June from a late Feb/early March sowing - and I've often picked the last few in early December! It just doesn't know when to stop - if you keep picking and feeding it occasionally, it just keeps on flowering and setting fruit! It's only very slight fault is that if you let it get too over ripe, or water just a bit too much when the skins have 'set' and are ripening fast, it may split. I take that as a fault of the grower though - not the tomato! I'd forgive it anything! If it does split - just throw those straight into the freezer without delay - as it tastes even better when cooked - brilliant in a roast ratatouille or a tomato sauce - although it bursts and doesn't hold together like Chiquito! It's the easiest tomato of all to grow - no need to remove side shoots as it's a bush. You could even grow this one in a window box, or under a large cold frame if you haven't got a greenhouse - as it's quite low and spreading rather than tall, or even in a large hanging basket. It's far better than any of the usual varieties recommended for doing that (most of which are pretty tasteless and have very tough skins). 2 years ago I also grew one in a recycled plastic mushroom box on the top tread of my LMFM/Late Lunch Show/'Tips from the Tunnel' stepladder garden, where it fruited all summer long. I promise you - anyone can grow it. I wouldn't be without it!! Chiquito F1 - (Simpsons seeds) A smallish, plum shaped cherry type, meaty/firm fleshed, dusky/pinky red. I first grew this one 10 years ago as it was described as having a very good flavour. I quite liked it - it was sweet with quite a good flavour though not that brilliant compared to Rosada which is always my taste yardstick now. Somehow it didn't really have that 'certain something' for me! It also made a very vigorous sprawling bush - not ideal in a greenhouse or tunnel border. Two years ago, however, I decided to give it another chance and try it in containers instead. Boy- am I glad I did! I grew it in my 10 litre containers on grow bag trays again this year, and I can definitely say I've now discovered another gem - not for eating fresh - but actually for cooking! Looking around one day for something to throw in a roast ratatouille - I grabbed a few handfuls of this one, and chucked them in whole half-way through. Cooking utterly transforms them! They stay whole without collapsing - and biting into them is like bursting an incredible flavour bomb! Amazing! I shall be growing more plants next year specifically for cooking - and freezing too, as in my experience those meaty, dense-fleshed small tomatoes freeze very well and are very useful in the winter for stuffing peppers etc. I think it could be good dehydrated too - as that concentrates the sugars in tomatoes and enhances the flavour, as long as they aren't too acid (don't do that with Sungold - it's horrible!). I cook them from frozen, just throwing them into a roast ratatouille half-way through cooking or into a pan of olive oil to use as a side veg. Latah Latah - (Real Seeds) Again very early, fabulous flavour (see Jane Powers article re 2013 TomFest) - but doesn't go on producing quite as long as Maskotka. It makes a larger, more spreading bush and produces a very large crop of all sizes and shapes - and some would definitely win weirdest shaped tomato! Some with a meaty centre like a mini beefsteak - others more like cherries. Disease resistant middle-sized bush - quite 'twiggy' rather than very leafy. The very first time I grew it, it was so almost 'leafless' that I thought at first it must have something wrong with it! Good air circulation as a result though. Doesn't have as long a season as Maskotka, but you could do two sowings - one early & one later on. One thing though is that the odd shaped fruits with lots of crevices can cling on to moisture a bit which can sometimes set up disease in damp years. Incas Incas F1 (Organic Gardening Catalogue & other companies) A very productive, great flavoured Italian plum type. Although it's a bush it's disease resistant despite being very vigorous. Two years ago I tried it in containers and it was terrific. Easy, good-natured and incredibly productive. Despite being a 'cooking' type also has quite a good flavour raw. This was the other one I found dehydrated brilliantly and the flavour deepened considerably - almost as good as Rosada for doing this. Greensleeves (Plants of Distinction) Quite a fruity flavour. Tastes better with some salt or basil oil. Cooks well - makes an unusual 'Tarte Tatin'! Hugely productive, impressive looking, very attractive green/yellow striped, sausage-shaped fruit on vigorous, disease-resistant, middle-sized bush. Crops for a long time. Something for a rather different salad perhaps - possibly worth growing for that alone. Not bad dehydrated. One of the ones I grow from time to time for looks alone - especially if there's a Tomato Festival happening!! Very attractive and unusual. Two unusual bush varieties that may be worth trying if you live somewhere less humid than me! They both have great flavour. Green Grape (tradeswindsfruitstore.com and Simpson's) very sweet small cherry, unusual and pretty olive greeny/yellow colour. Tasty. Very vigorous bush that can be disease prone if you don't limit the foliage a bit. Very productive otherwise but a bit of a pain as it drops it's fruit very easily once just ripe and the minute you touch the bush they drop off - then you have to search underneath the copious foiage! At least you know that they're ripe then - as that's difficult being green! Better in a bucket - I grew it in the ground 30 years ago from HDRA/Heritage Seed Library seed and it took over half of the tunnel! Cordon (upright) varieties - only bothering to review the very tastiest ones here or I would still be here next Christmas! As I've just said - if I only grew one tomato it would have to be this! Ab. Fab. flavour - and top of everyone's list who knows it or has tasted it here - the very best flavoured. Came top of the 'Which' taste trials some years ago - but no longer sold by the major seed companies for the reasons stated above. Great balance of sweetness and acidity. Very easy to grow and disease-free as it has well spaced, airy foliage, held well out from the stem. This is the one I ALWAYS recommend even for beginners. Very long trusses often almost 1m long - (I've had over 70 fruits on a single '3 branched' truss of one growing in a 10 litre container!) firm, meaty, small plum-shaped fruits that will last for absolutely ages on the plant so you can really ripen them to maximum sweetness. They may split eventually but only after about 3 weeks of absolute total ripeness and if your watering regime is irregular! (Sungold will split after only 3 days of being ripe!) They also keep for ages once picked, they freeze well and cook beautifully. Cut in half and dipped in hummus they are heavenly - or in fact anyway you like! Slow oven dried and stored in olive oil they are fabulous. 3 years ago I bought a dehydrator mainly for them and they are fantastic semi-dried, frozen and then re-hydrated in basil oil - yummy in festive salads, or 'delish' thrown straight into a roast ratatouille or stuffed sweet peppers! Such a good natured tomato - just as happy growing in buckets or the ground and always eager to please!! Has a tendency to keep on producing side shoots constantly from everywhere - but this is a plus as they easily root in a jar of water and you can pot some up for a later crop - thereby saving money on sowing more seed later. You can then bring potted ones into the house in late autumn to ripen their late fruits. What more can I say? If you only grow one - make sure it's this one if you can find it! You won't be disappointed. Please put pressure on seed companies to stock this variety again - it must not be lost!! Sungold F1 - (available everywhere) Ubiquitous and delicious! Everyone knows it now - wonderful flavour, slightly more acid than Rosada so sadly doesn't dehydrate well as this accentuates their acidity. Best eaten straight off the plant or straight away when you get it to the kitchen. Doesn't keep on or off the plant very long and splits easily at the first opportunity. I also find it runs out of steam generally at about 6 trusses - long before Rosada, which reliably sets 8+, and needs far more feeding to keep it going. One of my customers of over 30 years got her grandchildren to eat tomatoes with this one and Rosada - now they're always asking her for the 'tomato sweeties'! Tomato 'Apero' with yacon in foreground. Apero F1 - (Dobies and Simpsons) A baby cherry plum that has exceptional flavour, although not quite as good as Rosada as not quite enough acidity. It's sweeter than Rosada but without that slight tartness it needs to balance it for supreme flavour. It's not nearly as productive or disease-resistant as Rosada because it has a slightly more compact, less airy habit. It has quite a tough skin and a really dense meaty texture though and this is the only tomato I know which you can freeze, then defrost, and it can still be sliced in half afterwards! Great for a tomato 'Tarte Tatin' in winter. Blush - I discovered this little beauty for the first time this year - and it will be a permanent fixture from now on! A very beautiful teardrop-shaped, cherry plum striped in glorious sunset colours - it has the most stunning flavour! A wonderful balance of sweet/tart - the moment you bite into it your mouth instantly water.! My Tunnel to Table co-presenter Gerry Kelly was in raptures about it - and he's a Rosada fan too! Green Envy - another new one this year. An unusual olive green, pear shaped, cherry-plum variety. At first hard to tell when it's ripe because of it's green colour - but when ripe it takes on a slightly yellowish hue and is just slightly softer with a bit of 'give' when very gently squeezed. Sweet and juicy - now a favourite. Sets skin early, so careful watering needed after that or fruit may split. Tomato 'John Baer' - very early, productive & best tasting medium classic type John Baer - My absolute favourite in this category. non-hybrid (Plants of Distinction) A brilliant discovery in 2011 which I will definitely never be without again! Variable medium to very large round classic type that's not quite decided if it wants to be a beefsteak or a medium classic-sized tomato! It produces both. Very early and cropping well on into the autumn, it is vigorous and disease-resistant both in the ground and in containers. Such a heavy crop in my recycled mayo buckets that I had a job to stop it falling over! (Set 8 trusses even in buckets when well fed with Osmo organic tomato food) seems totally reliable - outstanding performance and superb flavour in our climate! Solid firm middle with no cavity looking more like a beefsteak. Can split if left on the plant too long. Lovely for salads and great cooked as well. A real favourite now. 'Ebony and Ivory' - the contrasting colours of tomatoes Indigo Rose & White Queen Indigo Rose - Couldn't leave this one out as the inspiration for the Totally Terrific Tomato Festival! (Got this from www.tradewindsfruitstore originally but last year Suttons Seeds had it) I couldn't leave this one out of course, as I was the first person to grow this in Ireland and poss. the British Isles 5 years ago when it was first introduced! The star of the 2012 & 2013 TomatoFests! Really stunning aubergine black - with rich ruby red flesh inside when ripe and the skin develops a 'slatey blue' sheen. Sadly looks aren't everything - even if it is absolutely a stunner! Very average supermarket-type flavour but with a very slight odd hint of liquorice - possibly from the anthocyanins. Also a slightly odd 'rubbery' texture to the fruit. It was bred from the only wild tomato with high levels of cancer fighting anthocyanins in the fruit, so I.R. is higher in these than any other tomato ever bred. Amazingly - since it was bred in the USA - I've found it a very easy to grow, very healthy, vigorous, short-jointed plants that set fruit easily so very productive and it didn't seem at all bothered by the low light levels we experienced in 2012. It was even better in 2013. Sets 8 trusses easily on plants only 2m high! Some of the Eastern European varieties I grew in 2012 only set 2 or 3 trusses very badly on 3m high plants!! It looks absolutely stunning with beefsteak White Queen in a salad, so celeb chefs would love it. It also deepens the colour of a tomato sauce significantly. Don't skin it - that's where the goodies are! Just blitz in a blender before adding to tomato sauces. (I do this with all my tomatoes - life is far too short to skin tomatoes anyway and it's totally unnecessary! Doing so loses valuable nutrients.) It's flavour intensifies on dehydrating and definitely improves although it shrinks quite a lot. A definite candidate for tomato 'sweeties'! Nyagous Nyagous - (Plants of Distinction) I grew this for the first time 4 years ago. Large, egg/baseball shaped blackish plum tomato, great flavour. Fairly disease resistant most years, and very productive even in containers. Definitely a good alternative to Black Sea Man. Another schizophrenic tomato that often produces beefsteak-sized fruits as well as medium sized! Moonglow cut & uncut, Nyagous & John Baer Moonglow - (Simpsons) Lovely fruity/sweet flavour - luscious almost apricotty texture. Bears large (beefsteak) to medium sized fruits on same plant. Stunning looking. Vigorous and disease-resistant old heritage variety. Incredibly productive - can tend to overcrop and become very heavy. A real favourite! Gorgeous sliced in a mixed variety Caprese salad. Well worth a place in any greenhouse! Pantano Romanesco - (I save my own seed but it's available now from Klaus Laitenberger Green Veg. Seeds and T&M's) What more can I say about this wonderful tomato that I haven't already said? It's the very best flavoured Italian beefsteak in my opinion (certainly for Irish conditions over the last 20 years) and I've grown most of them. Better flavour than any of the the Costulotos or Marmandes and much easier to keep healthy in our climate. Some of those others look very attractive with their convoluted, pleated odd shapes - but that shape attracts and traps damp which can cause disease. Pantano has a smoother skin and better flavour anyway. Michael Viney mentioned in his Irish Times column in August '11 that he had grown it on my recommendation and that it was every bit as good as I had said. He did also say though, that people ought to be warned early on about it's tendency to make side shoots with extreme enthusiasm - to put it mildly! It is very vigorous and can make extensive unnecessary leaf growth, particularly on the ends of flower trusses, so it needs looking at every couple of days and doesn't want too much rich feeding at first. It's one of the varieties I would never want to be without though. Quite possibly, when perfectly ripe, it might be the last tomato I would want to eat if I was about to leave this world! It's that good! Rich tomato flavour - eat it with some chunks of torn, softly yeilding buffalo mozzarella, a drizzle of good EV olive oil, a fresh grind of black pepper, a scattering of shredded basil leaves and crusty ciabatta and you're instantly transported to the Med.! Or for the very best tomato sandwich ever - a guilty treat with rarely home-made white bread which doesn't mask the heavenly flavour - possibly slightly toasted until 'marshmallowy' and with a slick of home made mayo! (OMG I'm salivating at the thought!) An absolute must for beefsteak lovers! Ananas Noir - (Plants of Distinction) Really delicious, strong growing and generally healthy beefsteak type. Very large fruits - some really huge 350-500g +! Outside an unprepossessing olivey/greeny/yellow colour - the inside so utterly beautiful you almost want to frame it! It's like eating a rainbow or an impressionist painting - all the colours of a Monet or Turner sunset! It can split a bit around top of some fruits near calyx when fully ripe and then may begin to rot from there if not picked immediately, but many of the older heritage and best-tasting beefsteaks tend to do this. Just one of the little foibles that you don't mind in the least once you've tasted it! The biggest one I've ever grown of this variety reached a weight of 856g or 1lb 15oz - so one can be almost a whole delicious meal! Neve's Azorean Red topped with Sungold to show scale! Neve's Azorean Red - (Plants of Distinction) A symphony of exquisite 'lipstick' pinkness! Huge beefsteak type fruits some 500g plus. Can also tend to split around stem end when ripening and must be picked straightaway then or it will quickly rot - but soft, yielding and utterly delicious - particularly with basil and garlic oil in a tomato and mozzarella salad. Well worth the trouble. Black from Tula. Grew this one for the first time this year. Not the most attractive colour! On the outside - a nondescript mahogany reddy-brown with greenish shoulders - it is a beautiful greeny-black inside. It has the same lovely sweet-smoky taste of Black Sea but is a cordon, so it's far easier to grow. It's also far heavier cropping and much more disease-resistant. It cropped well this year in container so I shall grow it in the ground in 2017. 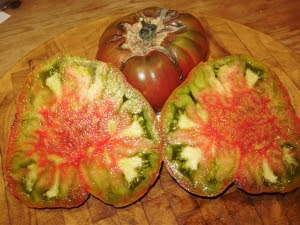 The easiest and tastiest of any of the darker coloured beefsteaks and I tried several for the first time this year. We loved it! Black Beauty. The blackest tomato of all so far! A very unusual and stunning beefsteak with a cherry red heart inside when really ripe, it has the best flavour so far of any of the high anthocyanin tomatoes which I've tried. Not the happiest in a container this year - I shall grow it in 2017 as I think it may be far happier in the ground and is definitely worth trying again. White Queen - (Also pictured above with Indigo Rose) from Nicky's Nursery seeds. Pleasant, not hugely 'tomatoey' but fruitily sweet and juicy, cream-coloured beefsteak. Interesting and makes an unusual, stunningly beautiful contrast in a mixed tomato salad. Quite healthy and vigorous. RTE gardening expert Dermot O'Neill liked this one a few years ago when he visited my tunnels for RTE Radio's Mooney Show! I grew it first over 25 years ago from HDRA/Heritage Seed Library (now Garden Organic) seed when doing a similar, smaller tomato event I mentioned at the National Botanic Gardens. Amish Paste - the best for tomato sauce Amish Paste - (Plants of Distinction) Large plum/beefsteak type. Not for eating fresh in my opinion! A fab cooking tomato - tastes of almost nothing when raw. It has a strange 'pasty'/meaty texture that changes vastly in cooking and then has a great flavour. It only tales a couple of fruits to utterly transform a huge vat of sauce made with any kind of tomatoes. Some sort of alchemy happens it's when cooked! Very productive. Just in case you're tempted by this one - Sweet Aperitif F1. - (I was given plants of this - so thought I'd just mention it. I tried it 3 years ago as a couple of people had raved about the flavour) The tiny, cherry sized fruit certainly have an intense sweet/acid flavour. I won't be growing it again though, firstly because I found it didn't fit into a mixed tunnel well. It produces huge fan-shaped trusses of tiny flowers (millefiore) which I found attracted botrytis (grey mould) very easily - even in a year which was warmer and drier than usual. The reason possibly is that in the mixed cropping environment of a normal back garden greenhouse or tunnel the atmosphere is usually a bit more humid - because most of us want to grow things like cucumbers etc as well. I think this is a factor often overlooked by seed companies and plant breeders. If you are growing only tomatoes then you could probably keep the atmosphere a lot drier - so perhaps it might not be so much of a problem. Another fault for me was that the fruits had very tough skins which I hate for eating raw - and it also split easily. I personally won't bother growing it again. I'm sure there are 100's of other varieties that would grow well in our climate that I haven't tried - out of the many 1,000s there are out there. But my criteria are first and foremost taste - then disease resistance, length of cropping time, earliness and ease of growing for back gardeners. They've got to earn their space! I reckon to get 5-6 months of cropping from most of them. I can't think of any other vegetable/fruit that is quite so generous for so long! Some catalogues give information on the number of days the variety takes to start cropping after planting - go for the shortest time as this indicates earliness to ripen - very important in our normal 'summers'! In a poor summer - the ones with the shortest time from planting to cropping should still do better than most others. My endlessly versatile Totally Terrific Tomato Sauce recipe, that makes the base for literally dozens of different meals, is on the recipe page of the website. Even if you don't have any tomatoes left in the freezer - you can still make this budget friendly recipe with tinned tomatoes and it tastes great! Served with pasta - it makes a cheap, filling and tasty meal for a family of four, for barely a couple of euros! By the way - life is definitely far too short to skin tomatoes! Unless they have a very 'woody' at bit at the stem end (in which case cut out) - then just throw them into a blender - whizz them and add to the sauce as in my recipe - or use them raw, just as they are, with some crushed garlic for a fabulously fresh tasting pasta sauce. Not skinning means you retain all the nutrients which are mostly either in, or just under, the skin, although cooking with oil in the sauce actually releases more of the important tomato phytonutrient lycopene, which has numerous health benefits. Urgent message for all fans of Rosada F1Tomato! I'm repeating this plea! Ask for Rosada please even though it's currently not available. Otherwise we will lose it forever! In Jan. 2015 I was speaking to Simpsons Seeds as I was having a slight problem with their website order. During our chat they told me that as from 2016 the scrumptious Rosada F1 cherry/plum tomato would no longer be available! Their supplier >wholesaler>breeder says that not enough of this wonderful little tomato is being sold. That is absolutely tragic! As many of you know, I think that this tomato is without doubt the very best cherry plum ever - and I've been growing tomatoes organically, both in my back garden and then on a larger scale commercially, for over 40 years now. I've tried literally hundreds of varieties over the years, trying to find better ones each year. There are far too many new patented varieties available at the moment - and very few that I would consider good enough to ever bother with again! It's an F1 hybrid (which doesn't mean that it's a GMO - something that could never potentially occur in nature!) F1 just means that it's a very specific cross between two known parents, done in isolation from other varieties, to ensure that it comes true from seed.That being so you will not be able to save seed from it and get the same result! Or if you do - you will possibly get seed, but you'll probably end up with a lot of mongrels - many of which may be no good - believe me - I've tried it! Producing an F1 hybrid is naturally a more expensive process than producing an open pollinated variety - so if it doesn't sell well enough - then the powerful commercial interests that now control most of the global seed industry just won't bother with it. Profit from their patents is their main criteria for selection! In general I favour non-F1 hybrids, as I save a lot of my own seed - but this tomato is an absolutely outstanding exception. THIS TOMATO REALLY IS WORTH SAVING - PEOPLE POWER COULD DO IT! ASK FOR IT EVEN IF IT'S NOT IN THE CATALOGUES - WE MAY BE ABLE TO GET IT BACK ON SALE IF WE DO!